There are currently no items in your shopping basket. 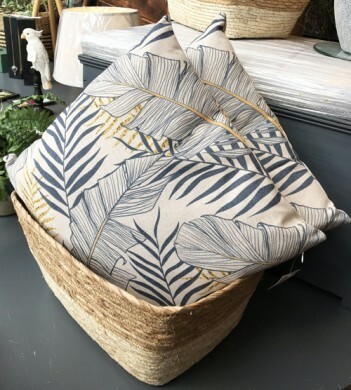 Linen look fabric cushion with a taupe coloured background and dark navy blue leaf palm pattern with mustard highlights. The zipped cushion cover is 100% Polyester. Comes complete with a Polypropylene inner pad. Please click on the photos to see both colour options and larger photos. Please select the £6.99 postage option to have these sent to you.